I am extremely grateful to each of you for your interest in scleral lenses and Scleral Lens Monthly! The positive comments are most welcome and appreciated. This column is devoted to you and your questions. 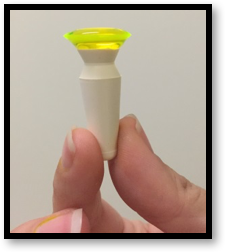 Many of you have expressed interest in incorporating scleral lenses into your practice and have asked how to get started fitting scleral lenses. Here is how to differentiate your practice with scleral lens technology. Hands-on workshops are the ideal way to learn how to fit scleral lenses. If you are new to scleral lenses, now is the perfect time to get started! There are more workshops available this year than ever before. Some scleral lens workshops are offered in conjunction with continuing education meetings and others are presented by scleral lens manufacturers (not in conjunction with a meeting). Another incredibly effective learning option is to have a scleral lens manufacturer’s representative come to your office and assist you while fitting patients. These workshops and trainings cover a variety of information including scleral lens application and removal, evaluation of each aspect of scleral lenses, and complications that can occur with scleral lenses. Since scleral lenses are such a hot topic, there are numerous meetings with scleral lens lectures. Most large meetings have scleral lens specific courses or specialty contact lens courses that include scleral lenses. There are lectures for both new practitioners and more advanced topics for experienced scleral lens practitioners. It is beneficial to attend lectures by different speakers to get a variety of opinions. Visit with representatives at the exhibit hall at these meetings to learn the specifics of each design and to handle the scleral lenses directly from each manufacturer. There are also meetings that specialize in contact lenses, such as the Global Specialty Lens Symposium held in January in Las Vegas, the Bronstein Cornea and Contact Lens Seminar held in January in Arizona or the Minnesota Contact Lens Society Meeting held in September in Las Vegas. In addition, the American Academy of Optometry and the American Optometric Association meetings have scleral lens lectures and workshops. Meeting information is advertised in optometric journals and a complete list of meetings is available on the AOA website. Figure 1. Scleral lens overfilled with preservative free saline and sodium fluorescein. The Scleral Lens Education Society (SLS) is a wonderful resource. The SLS has a membership program, a basic quiz for practitioners new to scleral lenses and a Fellowship program which demonstrates advanced knowledge and proficiency in scleral lenses. The SLS website (https://www.sclerallens.org/) has a vast amount of information including a video on scleral lens handling including application and removal (https://www.sclerallens.org/how-use-scleral-lenses). This video is shared widely and can be used in your practice and on the practice website. It is especially helpful to share with patients prior to the scleral lens dispensing appointment. Additionally, the SLS website has up-to-date news, access to multiple webinars, case studies, fitting guides, scleral lens fitting information, lectures, posters and a literature review. New to the website are a multitude of downloadable files for scleral lens indications including keratoconus, pellucid marginal degeneration, post-Lasik ectasia and Sjögren’s disease. A multitude of resources can be found on the Gas Permeable Lens Institute (GPLI) website (http://www.gpli.info). These include specific information on coding and billing, webinars, staff training information, patient brochures and practice management resources. New this year is the Scleral Lens Troubleshooting FAQs module which was developed in conjunction with the SLS (also found on the SLS website). A wealth of topics are covered including scleral lens indications, lens selection, scleral lens-induced complications and lens care. Now that you have the resources to start fitting scleral lenses, you can utilize this amazing technology in your practice. Utilize the manufacturer’s consultants to help answer any questions. You will not only improve the quality of life of your patients, but will also create patient loyalty and referrals which will grow your practice.